A Denver-based developer is capitalizing on end-of-days fears felt among Americans to market "doomsday bunkers" -- luxury condos set inside a Cold War-era missile silo in Kansas. 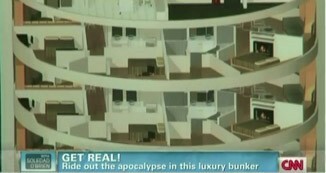 Developer Larry Hall's fortified condos are designed to be equipped with advanced security and survival apparatus aimed at allowing bunker residents to ride out Armageddon. Hall's doomsday venture marks the latest publicized effort to cash in on some Americans' desire to hedge their bets against the prospect of disasters of apocalyptic proportions. But his doomsday units don't come cheap: So far buyers have dropped $6.8 million to purchase four of the bunkers, Agence France Presse reports. Hall's marketing demographic, often referred to as "doomsday preppers," worry about "events ranging from solar flares to economic collapse, to pandemics, to terrorism, to food shortages," Hall told AFP. And the developer says that he's also set aside one for himself. Encased in a double layer of steel and concrete, the units are reportedly being built into seven of the structure's 14 underground floors. A whole floor costs $2 million, while half a floor goes for $1 million. Along with the condos -- one of which reportedly will have walk-in closets, two bedrooms, a kitchen and two living rooms -- the re-purposed missile silo offers an elaborate array of security and survival features. The complex will be poweredby both conventional and alternative sources, and draw some nourishment for its dwellers from giant underground water tanks and an indoor farm, AFP says. To protect residents from resource-starved intruders, the silo's elevator will be fingerprint-activated, while cameras installed around the complex will scan its barbed-wire fence. "If they try to climb the fence, we can stun them," Hall told AFP. "If they want to break into the system, we can put an end to that." Hall is just one of several developers to garner recent media attention for selling disaster bunkers. Vivos, a Del Mar, Calif.-based company, is building a network of the bunkers across the U.S. that are said to be fortified to withstand a 50-megaton blast within 10 miles. The company offers a more affordable option for doomsayers than Hall's condos: $50,000 per adult or $25,000 per child earns you shareholder status in one of its 200-person bunkers. The Vivos complexes would furnish inhabitants with common areas, medical clinics, a year's supply of food, and a 100-square-foot share of common space. Hall's high-end bunkers are equipped to sustain its residents through an even longer period of upheaval. Aside from the vegetable and fish farm, he's also cramming the complex with a five-year supply of dry goods. But his project goes far beyond just ensuring survival: Amenities also include a pool, movie theater, big-screen TVs and a home automation system, CNN says. The "prepper" phenomenon also has inspired a Discovery Channel TV show, "Doomsday Bunkers," which follows the Deep Earth Bunker company of Dallas through the process of constructing fortified shelters, like those offered by Vivos and Hall, and also provides a window into the "prepper" subculture. The movement draws "radical folks who really take these precautions to the extreme, to the average person who is using their common sense and taking responsibility for what could happen," the TV's show's executive producer, Anna Geddes, told FOX411's Pop Tarts column. The new show follows in the footsteps of "Doomsday Preppers," a National Geographic Channel show that debuted in February.